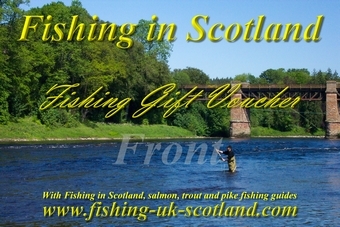 Gift Vouchers for Fishing in Scotland. Top quality venues on the finest salmon fishing rivers in Scotland. 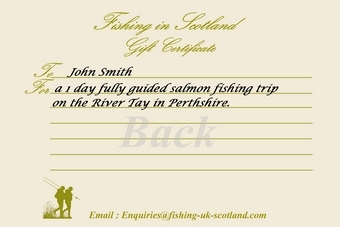 Ask about our gift vouchers for fishing trips in Scotland. We can offer specific experiences fishing for salmon, trout or pike, or a more general introduction to the sport with the gift of fly fishing or Spey casting lessons. Our vouchers are popular as business incentives, or for special occasions such as Christmas, birthdays, Father's Day, Mother's Day or retirement. Many a genteel stag-do has taken advantage of our voucher scheme, or perhaps you just want to say a special thank you to someone. Our upcoming new range of gift vouchers for 2017 feature a fine art print of a Scottish scene on heavy card, produced for us by a local artist, and of a quality that will allow your recipient to retain the card as a gift in itself, a cherished memento of a very special experience. Gift vouchers can be mailed directly to you, or can be directed to your recipient with your hand-written gift message. Situated on quality beats on the River Tay in Perthshire or the North and South Esk rivers in Angus, our salmon and Spey casting vouchers provide single or multiple days on the river, with the guidance of a professional salmon fishing and Spey casting instructor. Permits for quality beats of the river of your choice and all of the fishing tackle required are included, and vouchers for more than one day will allow us to offer your recipient the option of different beats or rivers daily, providing a more varied experience. Regardless of the location, your recipient will be entertained in comfort, with a complimentary dram to toast their fishing experience. Whether intended for a seasoned salmon fisherman or a complete beginner we have a salmon fishing gift voucher to suit all levels of experience. Fly fishing lessons for brown trout and rainbow trout take place on a variety of rivers and lochs throughout Scotland, and can be organised as boat or bank fishing on a loch or river dependent upon your recpient's preference. Including a professional trout fishing and fly fishing instructor, permits, boat hire and all necessary fishing tackle, all your recipient need do is turn up, then go home with a new skill and an experience to remember. Pike fishing from boat or bank offers a heart-stopping thrill when the big fish bite. Based on a variety of lochs in the Trossach National Park (around an hours drive north of Edinburgh) our good humoured and long experienced guides will ensure an enjoyable trip stalking the mighty pike. Permits, boat hire, tackle, and the wealth of knowledge available from our guide are all included. Our gift vouchers can be for any type of fishing or Speycasting and fly fishing lessons above or any combination of days. We can put togeher a trip which includes salmon, trout and pike fishing. We can also assist in arranging local accommodation and airport transfers from Edinburgh or Aberdeen Airports. Our guide will pick you up from your hotel each day and take you to the fishing.